On March 13, Ralph Blumenthal and I published a story about a case from Chile which has since sparked considerable controversy. The official UAP research organization in Santiago, known as the CEFAA (Committee for the Study of Anomalous Aerial Phenomena), had provided information about an anomaly caught on multiple video tapes during an air show at the nearby El Bosque Air Base on Nov. 5, 2010. Gen. Ricardo Bermúdez, Director of the CEFAA, first showed one of the videos -- the same one we released -- during his lecture at the International UFO Congress in Phoenix last February. "Seven spectators located in different places, each with his own camera, filmed the flybys. In the seven videos, the same thing appeared," he told the audience. His lecture is now posted at the CEFAA website. I interviewed the general just before his Phoenix presentation, having been tipped off about the case after contacting the CEFAA a few days earlier. "Something anomalous was there, and our astronomers, who are non-believers, said it's an object," he told me. "When it approaches, there is an intelligent maneuver demonstrated. What it is remains unknown, but we are not finished with the analysis." Experts in Chile examined the footage, which comes from digital cameras and cell phones, and ruled out conventional explanations. "We have studied this case in different ways," said Bermúdez in his lecture. "First we gave all the films it to our astronomers. They proceeded with their own software and system. Second, we gave the film to the air force specialists, the Air Photogrammetric Service. They used their own procedures. Third, we at the CEFAA made an internal analysis with our own specialists." And he added: "We will continue making an analysis and hope we can arrive at a scientific conclusion as soon as possible." Among the Chilean analysts, Alberto Vergara, an expert in digital imaging, stated that "When we examine the whole scene frame by frame, we have been able to realize that [the object] has, apparently, moved at a speed far superior to any flying object of known manufacture. Therefore it is worthy of continuing to investigate its origin." Perhaps Blumenthal and I asked too many provocative rhetorical questions and did not stress enough that this investigation is continuing, as Bermúdez and Vergara stated. And now the search for the "scientific conclusion" has been given new life. After the story broke, photo analysts and investigators from several countries approached the CEFAA and asked if they could study the videos. A few, because of their qualifications, have already begun detailed, independent work on the case. They will remain anonymous for now. Further questions, some of which have been raised in response to our story, will be addressed by them during this process. In accordance with the wishes of the scientific team in Chile and these new analysts, General Bermúdez will not be releasing any more videos now, so that the public can be fully informed and maximum understanding achieved when the full package is released. Those involved agree that the new studies should be completed first. The CEFAA is committed to the resolution that everyone is requesting, but it will take time. No, the organization is not trying to hide anything; I have full access to this investigation and will monitor it as it develops. It is clear to me why Bermúdez isn't going to prematurely toss the videos out onto the Internet to be played with by unqualified people -- especially after what happened with the first clips. Skeptics caused quite a stir by taking it upon themselves to do their own "analysis" of the video clips and then to declare, with bravado, that the object of concern was simply a bug. Often this involved misquoting or misrepresenting me and the CEFAA in accompanying text. The question of qualifications aside, these individuals were handicapped by one even more overwhelming problem: Tthey were working without the necessary data required to make a proper analysis, and, most importantly, they were looking at video clips pulled from only one of the multiple cameras. "The existence of more than one video, taken by different people at different distances catching the same scene, inclines us to believe this is not just a bug," Bermúdez told me last week. "We do not owe anything to anyone on this, because we are interested only in the science. However, we will give further details when these other studies are completed." I am neither a photo analyst nor an entomologist. All I've done so far, in partnership with my colleague who writes for The New York Times, is report to you what the best sources in Chile told me about this intriguing case. Now we all have to wait for further information, and be respectful of that process. But in the meantime, let's have some fun with the bugs. When the CEFAA examiners first viewed the tape we've seen, presented to them by an engineer who noticed the odd object when he slowed down his film, they too thought it likely that the jumpy little thing was a bug. However, they decided to try and locate additional films. 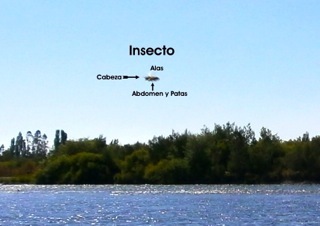 It was only after discovering that the object appeared on these other videos from different locations -- taken by cameras too far apart to capture the same insect -- that the Chilean analysts realized this object could not be possibly be a bug, according to CEFAA staff. Even so, I decided to look into this myself by showing the video, PowerPoint slide show, and close-up stills of the object to American entomologists, hopefully with a knowledge of Chilean bugs. 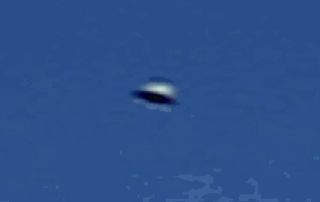 After all, wouldn't they be the best qualified to determine if indeed our UFO could be some kind of insect? I found three credentialed entomologists, and I phrased my question without any bias and with no mention of why I was asking, other than "for research." The simple question posed was: Do you think this could be a bug? I phoned Jason J. Dombroskie, the insect collection manager and coordinator for the insect diagnostic lab at Cornell University, at his request after he received my emailed information. Could this be a bug? "It's possible, but I would be very surprised," he said. He thought a bug would more likely look like a blur, and noted that beetles are slower flyers. The speed would suggest that it's much closer to the camera than it looks. "It could be anything," he concluded. Brett C. Ratcliffe, professor and curator at the University of Nebraska State Museum and Department of Entomology, received "outstanding paper of the year" awards by the Coleopterists Society in 1992 and 2005 and has had 19 species of insects, mostly scarab beetles, named after him. 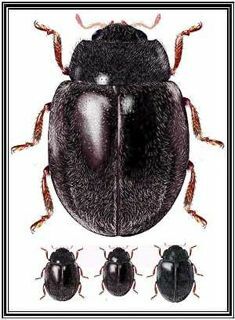 (A beetle seems the most likely choice here, given the rounded, dome shape and flat bottom of the clearest close-ups from the videos.) "Pretty amazing," he replied to my email with its strange attachments. "No idea what it is but it does not seem to be an insect . 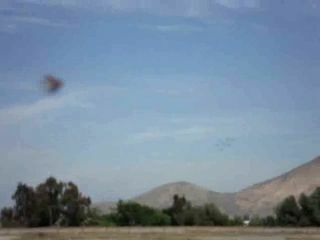 . . altho very fast flying insects captured on slow shutter speeds do look like amorphous blurs or blobs. I am forwarding these to several colleagues and asking around." Amorphous blobs? 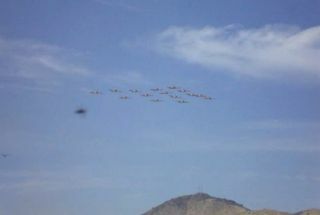 Yes, that's more often what flying insects close to a camera look like. A few days later, Ratcliffe emailed again. "I have queried several of my colleagues to see if anyone might have thought an insect could be responsible for the anomaly in the images. No one had any idea of what could have caused that." I then found someone who specializes in Chilean bugs. Raised in Santiago, Elizabeth Arias taught entomology at two Chilean universities for five years, before moving to the U.S. In 2000, she published a book on Chilean beetles, and has extensively studied the beetle fauna of southern Chile. "I am very familiar with species of insects in Chile," she wrote in an email. After viewing the materials, she replied. "I would say they were not insects." She highlighted this in purple to make it stand out, at the end of her text. "When Beetles fly, their wings stand up, and the membranous wings that are under are flapping. I have seen insects flying many times and their photo looks like a torpedo, is more oval, and that is why I can not see or imagine where the legs and wings could be." She then said she would think about this further. 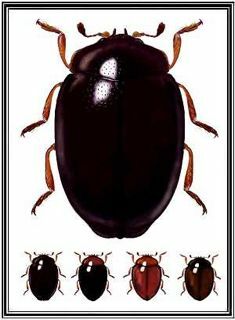 Her description of typical beetle photos sounded a lot like the three images shown above. The next day, April 10, she wrote again: "I talked with a friend from Chile about this photo and he says that it might be an insect only if the insect passed CLOSE to the camera [emphasis hers]." Then she highlighted another line in purple: "But what it is is not possible to determine." The entomologists, the most qualified to judge the speculative bug hypothesis, seem to have reached an independent consensus from looking at the same material provided to the rest of us: this is very probably not a bug; it's impossible to determine what it is. If they couldn't tell it was a bug, how could anyone else be so sure? I'm not claiming this little foray into the world of entomology was in any way a definitive or rigorous expedition. But it certainly was enlightening. Stay tuned for the real science, down the road. LESLIE KEAN is an investigative journalist and author of the New York Times bestseller UFOs: Generals, Pilots and Government Officials Go On the Record. Visit her on facebook at http://www.facebook.com/lesliekean.